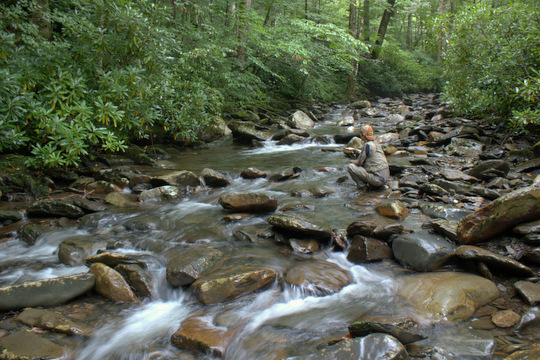 This time of year normally features low water and spooky fish regardless of whether you are on a Cumberland Plateau smallmouth bass stream or on a brook trout stream in the Great Smoky Mountains National Park. Fly fishing under these conditions can still be good to even excellent but different from those nice high flows of spring. 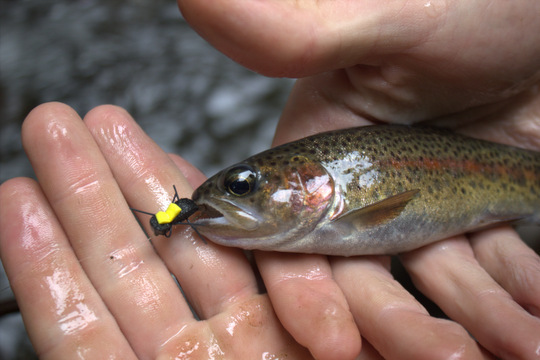 In short, low water requires that you channel your inner ninja and utilize every piece of cover along the stream to avoid being seen by the fish. 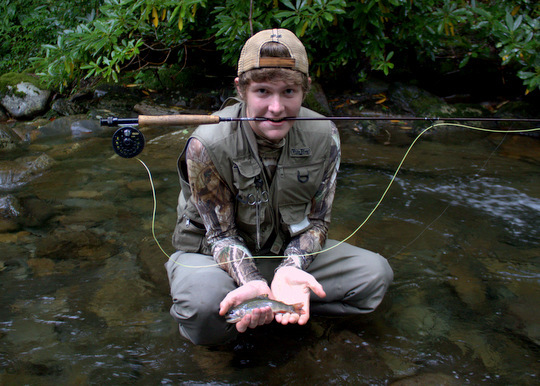 Recently I had the privilege of taking a young man on a fly fishing trip. This excursion was a gift to Jordan from his parents for his high school graduation. Talk about a great graduation present! As the trip approached, rain was often in the forecast including for the day we were supposed to fish. Finally, the day of the trip had arrived without any noticeable rainfall. We started off on some larger pocket water to get Jordan dialed in to the techniques and tactics required for success in the Smokies. Then, after a good but quick lunch, we headed up higher to hunt some brook trout. 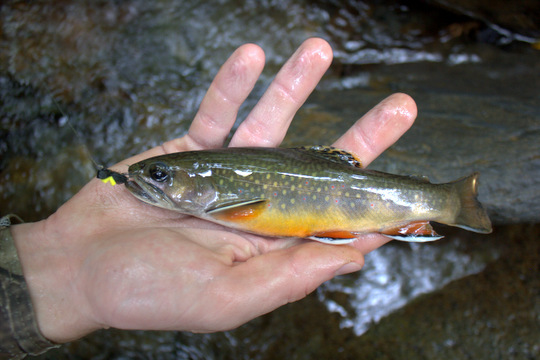 The southern Appalachian brook trout are gorgeous, especially now as we are heading towards the fall spawn. We were hoping to find a few of these jewels. Noticing another guide parked where I originally intended to start, we simply went for plan B and headed further up the mountain. By the time we hit the stream, I had completed my "We have to be stealthy" speech and Jordan was ready to catch some specs. One of the more enjoyable things about having a younger angler on the water is their willingness to crawl or do whatever else it takes to get close to the fish without spooking them. Jordan was no exception, and as a hunter and all around sportsman, he was used to being out in the woods. We snuck down into the streambed and started slowly making our way upstream. Normally under these conditions, I'll take the lead on these small streams to spot trout. Once a fish or likely spot has been located, I'll ease off to the side and the angler will move into position after a whispered discussion on approach. This trip was about the same as usual. 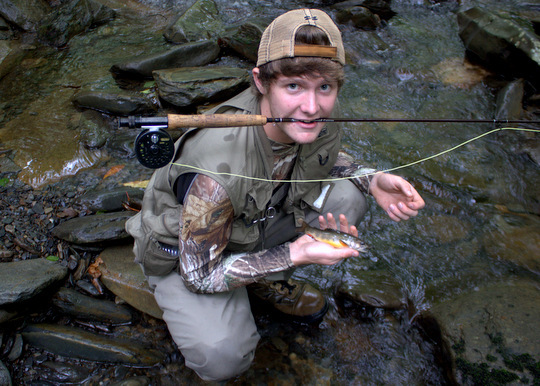 Soon we found a willing fish and Jordan caught his first brook trout! Several others soon followed. After this first trout, we continued to move slowly up the stream and Jordan would at least get an eat out of most likely spots. Enough of these fish were getting hooked to keep us focused and enjoying ourselves. Finally, a larger pool was just above us. I hung back to avoid spooking anything and explained to Jordan how to crawl up to the stream and cast. 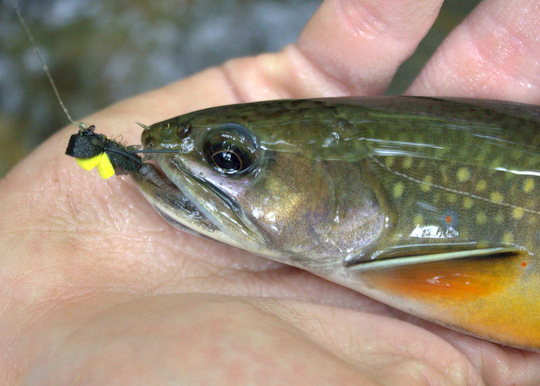 After a few well-placed casts, a very nice brook trout for the water attacked his fly and the fight was on. We soon corralled the beautiful fish and obtained the documentation to help him remember this trip. And so our afternoon went. Moving slowly upstream, crawling, scrambling, kneeling, the fish were no match for these stealth skills Jordan was displaying. A few nice rainbow trout graced the end of his line in addition to the brook trout we had come to catch. Most of these fish were caught on beetle patterns. 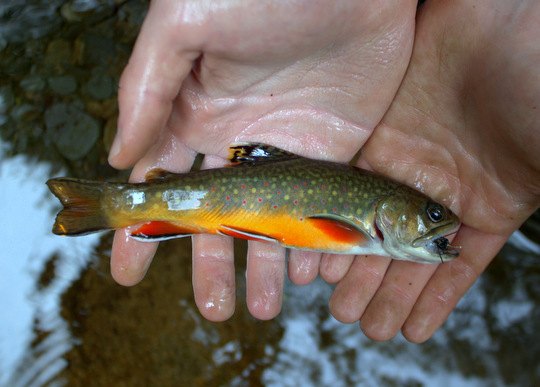 This is one of the most enjoyable ways to fish this time of year on the small brook trout streams. As we started to run low on time, we just happened to stumble onto the best catch of the day. Notice I did not say largest although it was a nice sized brook trout for the small water we were fishing. 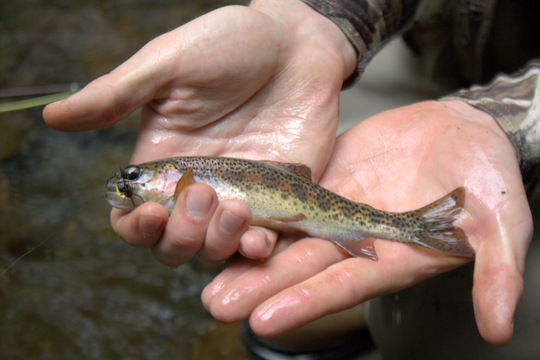 Sometimes the best fish is one of the smaller ones, it just depends on how you define best. This fish in particular was rather unusual both in where it was caught and how much prettier it was compared to the rest we were catching. The colors were amazing and more like something we'll see in late September. The best part about this fish was that neither of us actually saw it eat the fly at least not exactly. I just knew approximately where the fly was and saw the brilliant colors as the trout rolled on the surface. I yelled "Set!" and Jordan had good enough reflexes to get the hook set solidly on the fish. We had a good chuckle about that one. Before we knew it the day was over, but not before Jordan gained a large arsenal of skills that will help him have success on just about any small stream he may encounter. If you would like to book a guided fly fishing trip in the Great Smoky Mountains National Park or on the Caney Fork River, please contact me (David Knapp) via call/text at (931) 261-1884 or email me at TroutZoneAnglers@gmail.com. Mark, the only way if you want to be highly successful!